Patrick O’ Brien’s striking Paintings capture the glory and grandeur of the age of sail. O’ Brien was a draftsman in a val architecture form before becoming an artist, and since 1985, has been a full-time artist. In 2003 Mr. O’Brien entered the marine art field, and his first entry to the prestigious Mystic International Marine Art Exhibition won an Award of Excellence. In 2010 he won Mystic’s Museum Purchase Award, with his painting being purchased by the Mystic Seaport Museum for its permanent collection. In 2012 The National Maritime Historical Society awarded O’ Brien with their Outstanding Service Award for his body of artwork. In 2010 the U.S. 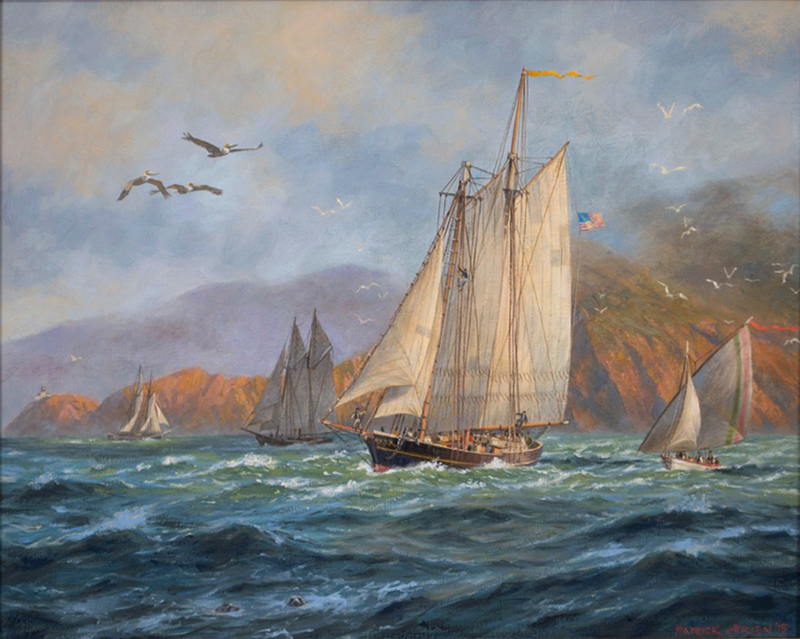 Naval Academy Museum mounted an art exhibition entitled The Maritime Art of Patrick O’ Brien, featuring 28 oil paintings by the artist. 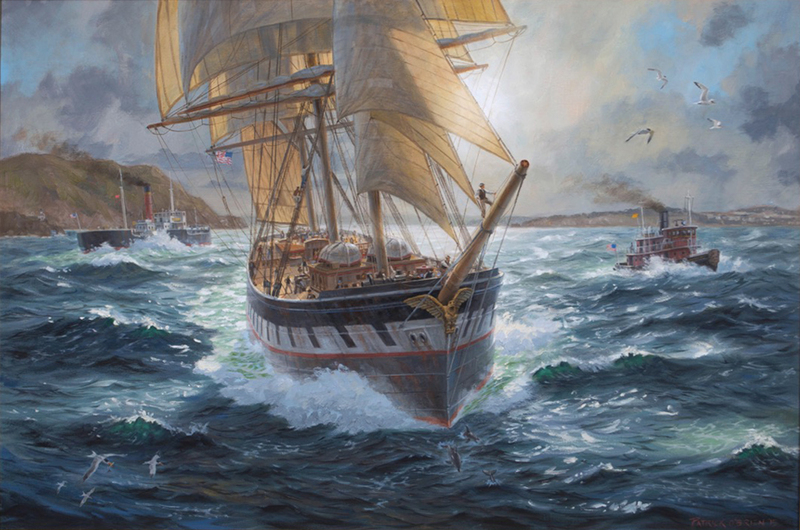 O’Brien’s paintings have been used four times on the cover of Naval History magazine, published by the U.S. Naval Institute, and he was the subject of a four-page cover article in Sea History magazine, published by the National Maritime Historical Society. O’ Brien has delivered lectures about his work at various maritime venues, and in 2008, a production team making a documentary for the History Channel filmed him working in his studio. Mr. O’Brien lives in Baltimore, MD. Specializing in historic and prehistoric subjects, he worked for such clients National Geographic, The Discovery Channel, and the Smithsonian. His illustrations were used in magazines and newspapers, on posters and greeting cards. He has created many commissioned paintings for private individuals, as well as for corporate clients such as ExxonMobil, the U. S. Coast Guard, the U. S. Naval Institute, and the National Maritime Historical Society. has delivered lectures about his work at various venues. has written and illustrated 12 children books.